Nice Easter basket. So, already have a removable cross-member I assume. Makes the job much easier!! Backed it out of the garage last night about 6:30....WOW! This is what these cars are meant to have! I can't believe I ran an automatic for so long. Feels like a completely different car, for the better. So much more responsive. I hadn't realized how slushy the TH400 was even though I had it hopped up as well. I'm sure the fresh 383 in front of it helps a bit too, but the difference in the way it feels as a "performance car" is magnificent. Only have about 50 miles on it so far, but I'll be racking up more quickly. I'm still taking it easy for break in, I can hardly wait to really exercise it. I'm really looking forward to putting it on the dyno too, to see what the difference in power to the wheels is compared to the TH400. I sure feels like a lot more, even given that I now have a direct connection thru more gear ratios. I remember when I did it back in 2007, totally feels like a different car !!!! Last edited by 84rzv500r; 07-20-2015 at 05:19 PM.. I would really change the oil in th tko gearbox after 50 miles. I changed my oil after 2 (!) miles and I was chocked by the amount of particles that came out with the oil... Just not small particles but actually large metal chips from the milling of the aluminum housing ! I then changed oil 2 more times during the first 1000miles and now, after almost 2000 miles the oil is clean. My tko came from Keisler, hopefully your distributor did a better job of cleaning the casing than the people at Keisler. I'm super happy with my tko600 now and it has really started to become smoother during shifts. Yeah, good thought. From the looks of it all as it arrived from SST, I would be very surprised to find crap in it, but it is a fresh new trans so there's bound to be some stuff. I'm still running the DexMerc ATF as they recommend for break in, but I too will change it out this weekend. I'll have about 200 miles on it and I will replace it with more of the same for the rest of the 1000 mile break in period before I put in the GM Synchro fluid. And for a progress report: I can feel it loosening up, becoming easier to shift. I've only stalled it twice, starting in 3rd instead of 1st. OK, and once in reverse. Hey, gimme a break! For almost 15 years it was an automatic! I'm getting used to the ratios & matching the shifts, and trying real hard to resist hotrodding it. It just cruises so nice and easy though, that's not a big problem. It's fun watching my new A/F mixture & vacuum gauges too. Flushed mine out today--With 400 miles on it, it was as pure and clean as I've ever seen a fluid come out of a gearbox of any kind. Nary a speck nor sparkle in it. Made me feel good to see. Here is my chassis dyno readout for the TKO600. It uses one half the power of the TH400. The auto sucked 25% of engine power, the manual only 12%. I gained 60 lb/ft of torque and almost 50 horsepower to the wheels. Why didn't I do this years ago? The car now performs like it was meant to. 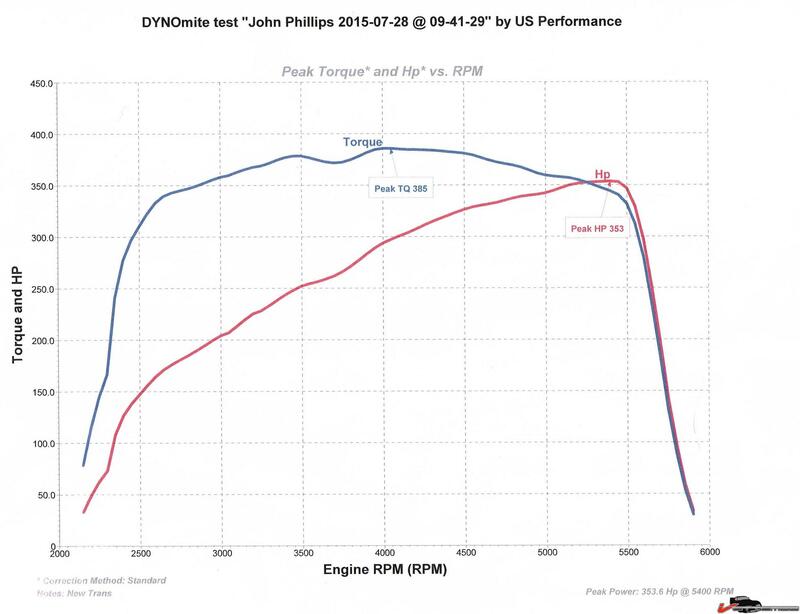 Edit: Woops, I meant to put this in my dyno comparison thread. Oh well, it's in both places now! Last edited by JPhil; 07-29-2015 at 02:17 AM..